Using Reparameterize to build better meshes - an example. 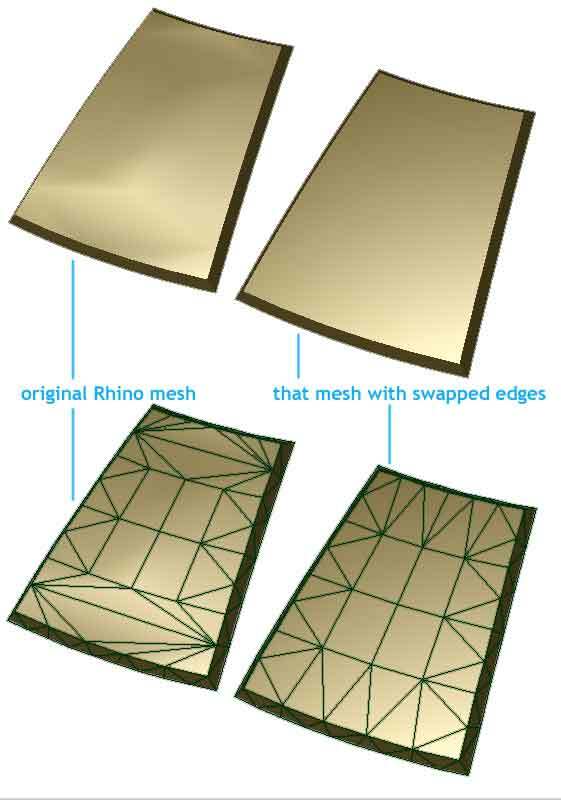 Willem Derks [2006-01-05]: At certain places in the mesh Rhino tends to create faces that are visually unlogical and result in a mesh with “dents” When swapping some edges the mesh appears as it “was intended”. The attachesd image shows a sample before and after swapping. At the moment I either manually adjust these anomalies by swapping edges or in meshes that are to complex I have to increase mesh settings which result in (unnessacery) large files. Anyone have a way around this? Jim: One thing I do for that kind of problem is use the Reparameterize command with the Automatic option on the troublesome surfaces. Willem: Thanx James. Waaw! It does (in a quick test) the Job!